University of Lynchburg is revolutionizing the way it prepares teachers for the classroom with a one-of-a-kind program that starts in the fall of 2019. The Teacher-Scholar program, part of the College of Education, Leadership Studies, and Counseling, will accept its first cohort next fall as part of a completely restructured teacher-candidate preparation program at Lynchburg. The benefits of the Teacher-Scholar program are numerous. Among other things, each Teacher-Scholar has an advisor from the College of Education, Leadership Studies, and Counseling. They receive preference in registering for classes and student teaching placements, and they have opportunities to study abroad in Chile, South Korea, and possibly other sites. Teacher-Scholars work with faculty to research and implement meaningful projects of their own choosing. The program has colloquial courses, including one on creativity, and Teacher-Scholars have the opportunity to live together as a cohort, first in the freshman residence halls and later in a living-and-learning community being planned for the new residence hall that’s currently under construction. 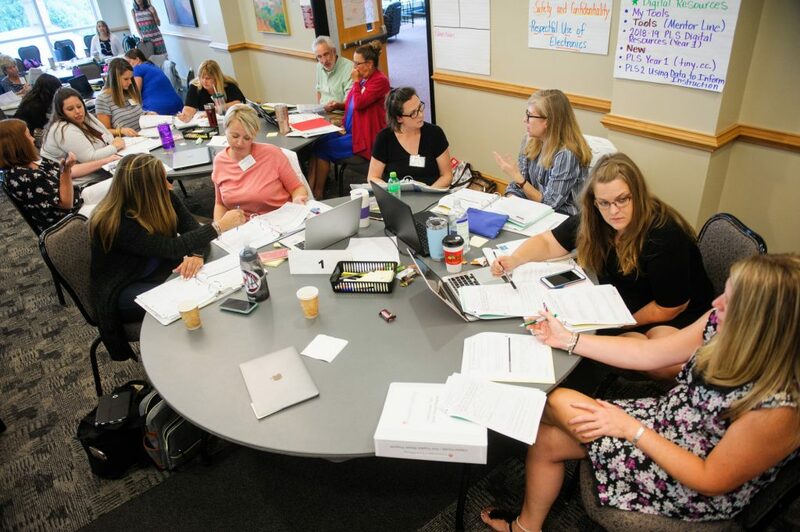 Local teachers participate in mentor-coaching training this fall at Lynchburg. Teacher-Scholars also are paired with local teachers who have been trained in the New Teacher Center Mentor/Coaching Model. All teacher-candidates at Lynchburg are paired with mentors/coaches during student teaching, but Teacher-Scholars start working with them earlier, during their last field experience. The College of Education, Leadership Studies, and Counseling launched the Clinical Faculty/New Teacher Mentor Program in 2018. The mentors/coaches are trained through a partnership with the New Teacher Center, a California-based nonprofit that helps school divisions and states establish mentoring programs that help new teachers succeed. In compliance with new state requirements, the University of Lynchburg is working to receive national accreditation from the Council for Accreditation of Educator Preparation (CAEP) by the fall of 2021. “Our goal is to obviously do more than we’re required to do for that,” Dr. Jones said. Beyond these and other benefits of the Teacher-Scholar program, there are financial aid incentives. In addition to other forms of financial aid available to University of Lynchburg students — merit awards, Virginia Tuition Assistance Grants, etc. — everyone in the new program will receive the Teacher-Scholar Award. Also, teacher-candidates who qualify for federal teacher loan forgiveness and receive the entire amount available over five years will have their loan reduced by $17,500. “When you package all those together and recognize the potential loan forgiveness option, there’s a real financial incentive that makes becoming a teacher at the University of Lynchburg more affordable,” Dr. Jones said. For more information about the Teacher-Scholar program, including other benefits and criteria for selection, visit the Teacher-Scholar web page.